Water exhibits cyclic flow between atmosphere, land and sea, and between living organisms and their environment. This is referred to as Hydrologic cycle or water cycle. Without cycling of water nutrients could not flow through the ecosystem, ecosystem could not function and life could not be maintained. 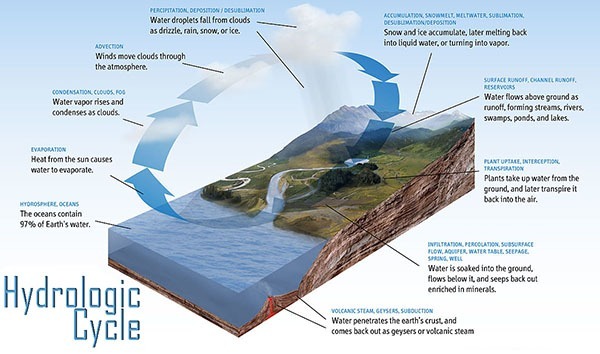 Water cycle is characterized by precipitation, interception, infiltration, and evaporation. Precipitation results from condensation of water vapors derived from the surfaces of oceans. It is the major source of soil moisture and driving force of the water cycle. Precipitation begins as water vapor in the atmosphere. When the air rises it is cooled and when it rises above the temperature level at which condensation takes place, clouds form. The condensing moisture aggregate into droplets and when these reach a diameter of about 1 mm they fall as rain droplets. As the precipitation reaches the earth, some of the water the ground directly. Some is intercepted by vegetation and by buildings etc. Because of interception various amounts of water evaporates into the atmosphere without reaching the soil surface. The water falling on the imperious surfaces runs off and drains off. The precipitation that reaches the soil moves into the ground by infiltration. More intense the rains, the greater the rate of infiltration. Water entering the soil percolates or seep down to an impervious layer of clay or under the influence of gravity (gravitational water). This water accumulates ground from here the water moves into springs, streams, and finally to rivers and portion of ground water is utilized by humans for domestic and industrial purposes. A part of water is held in the soil by capillary forces between the soil particles. It is called capillary water. Water remaining on the surface of the ground, on the surface of vegetation, and water in the surface layers of streams, lakes and oceans return to the atmosphere by evaporation. Further loss of water from the soil take place through plants. Plants take in water from the soil through the roots and lose it through the leaves and other organs in a process called transpiration. The total loss of water from the surfaces of the ground and vegetation is called evapotranspiration. Water exists as invisible vapour (humidity) and visible vapour (cloud and fog) in the atmosphere. The actual amount of water vapour present in the atmosphere is known as absolute humidity. It is measured in ounces per cubic yard or grains per cubic foot of air. The absolute humidity differs from place to place on surface of the earth. It declines If one moves from equator (20 mm) towards the poles (1 mm). The percentage of moisture present the atmosphere as compared to its full capacity is called relative humidity. It is defined as “Percentage of the maximum quantity that the air can hold at a temperature”. Temperature is the most Important factor that governs humidity. Warm air can hold more water than cold air. The capacity of air for holding water invisible vapour doubles with each increase of 11 degree Celsius in temperature. When a body of moist, warm air is cooled, the relative humidity approaches 100% and if further cooling takes place the excess vapour is condensed into droplets of liquid or dew. Relative humidity is low during day and high at night. In rain forests the low relative humidity may be above 80% whereas in deserts it may be below 10%. The relative humidity usually decreases with distance above the ground especially in regions with dense cover. Cloud and log consists of water droplets or sometimes ice crystals formed from the cooling of air to a temperature below its dew point. They differ in their location. Cloud is separated from earth almost always whereas fog is formed at or near the land surface. When further cooled both cloud and fog condense into droplets large enough to precipitate out of atmosphere. Clouds are formed when air moves upward from land surface into colder regions of atmosphere. The fog is formed by warm air passing over cold water currents in the sea, by warm rising up a sloping land surface to high elevations, and by rapid cooling of land surface during night. 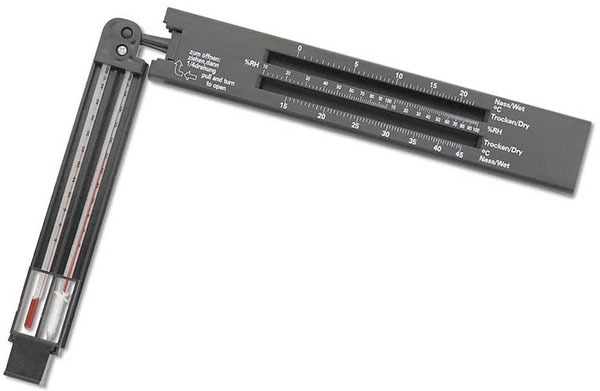 The most common instrument used to measure relative humidity is called psychrometer. It consists of a pair of thermometers. The bulb of one thermometer is covered a thin muslin cloth. The cloth is wetted just before the instrument is to be used. The pair of thermometers is whirled in the air. The temperature of wet bulb will drop than that of dry bulb because of evaporation. The dry bulb indicates true air temperature. At 100% relative humidity, the two thermometers give identical reading. By means of two temperatures obtained, the relative humidity can be read directly from tables prepared especially or the purpose. Water vapours in the atmosphere intercepts much of solar radiation (heat, light and other rays transmitted from sun) before it reaches earth. Less energy becomes available for transpiration and photosynthesis affecting the plant growth. The common examples of this effect are slow-growing dwarfed trees. With all other factors remaining constant, the rates of evaporation and transpiration are directly proportional to relative humidity. An increase in relative humidity reduces the rates of evaporation and transpiration and vice versa. When fog moves horizontally, or a cloud comes in contact with earth’s surface, minute water droplets are deposited as they pass through foliage and it may be absorbed directly. This precipitation is of immense importance in arid regions (regions with less rainfall). In some rainless habitats it serves as the sole source of water for plants. Desiccated mosses and lichens absorb moisture from a humid atmosphere without waiting for its condensation. These species are important ecologically since these are pioneer species in a xerosere. Similarly, some epiphytes (tropical orchids) and some xerophytes can also take up water directly from air when relative humidity rises above 85%. Dew formed on leaves may be absorbed through cuticle or through specialized cells.